2006-05-30 First worldwide family litigation filed litigation Critical https://patents.darts-ip.com/?family=7660081&utm_source=google_patent&utm_medium=platform_link&utm_campaign=public_patent_search&patent=US20040049059(A1) "Global patent litigation dataset” by Darts-ip is licensed under a Creative Commons Attribution 4.0 International License. The invention relates to a method for producing an extract from cannabis plant matter, containing tetrahydrocannabinol, cannabidiol and optionally the carboxylic acids thereof. According to said method, the dried plant matter is ground and subjected to a CO2 extraction and the primary extract obtained is separated. The invention method permits Δ8 or Δ9 tetrahydrocannabinol to be selectively obtained both from industrial hemp and from drug-producing hemp, optionally after dissolving the primary extract in ethanol, separating undesirable waxes and removing the solvent under reduced pressure. Cannabis (hemp), together with the genus Humulus (hops), belongs to the family of Cannabinaceae, with hops, for instance, not containing any cannabinoids. For the botanical and chemotaxonomical differentiation of the genus Cannabis there are two different concepts. One differentiates between three species,  Cannabis sativa Linnaeus, Cannabis indica LAM., and Cannabis ruderalis, while a different theory only sees the existence of the one collective species Cannabis sativa L. made up of the subspecies Cannabis sativa ssp. sativa and ssp. indica. Moreover the cannabis plant is differentiated into a drug type and a fiber type, with differentiation being performed on the basis of the quantity ratio of the main cannabinoids, cannabidiol (CBD) and Δ9-tetrahydrocannabinol (Δ9-THC). Fiber hemp, whose cultivation is permitted for fiber production, must not exceed a Δ9-THC content of 0.3% relative to the dry plant mass, while the drug type may exhibit a Δ9-THC content of approx. 5% - 15% relative to the dry plant mass. The ratio of Δ 9-THC to CBD in fiber hemp is mostly less than 1.5. The varieties rich in Δ9-THC may reach a ratio of 2:1 to 7:1. Cannabis sativa L. occurs worldwide in all warm and moderate zones with the exception of the humid tropical rain forests. It is an annual to biennial, anemogamous herb which may attain a height of up to 8 m. The dioecous, rarely monecious inflorescences contain the active cannabinoids in the resin which is mainly secreted by the numerous glandular bracts in the leaf axils. As a general rule, all the plant parts of Cannabis sativa L. with the exception of the seeds may contain cannabinoids. The highest cannabinoid concentrations are found in the floral bracts and fruit stalks. The leaves have a low content of cannabinoids as a function of leaf age, while the stalk and particularly the root exhibit clearly lower cannabinoid contents. Cannabis sativa L. contains more than 420 different components, with 61 compounds of these belonging to the class of cannabinoids. These are lipophilic, nitrogen-free, mostly phenolic compounds. The neutral cannabinoids are biogenetically derived from a monoterpene and a phenol, the acidic cannabinoids from a monoterpene and a phenolic acid, and present a C21 parent substance. In literature, two different numbering systems for cannabinoids are found. The older numbering system is based on the monoterpene skeleton, whereas the more recent IUPAC designation which is exclusively employed in the present application, relates to the dibenzopyrane skeleton. Besides the above mentioned cannabinoids, the associated carboxylic acids thereof are moreover found in the raw drug as well as in the plant products. As a general rule, the carboxylic acids have the function of a biosynthetic precursor. Thus, for instance, the tetrahydrocannabinols Δ 9- and Δ8-THC and CBD are generated in vivo from the THC carboxylic acids by decarboxylation from the associated cannabidiol carboxylic acids. Δ 8-THC may, for instance, also form upon cyclization of CBD. Another possibility is that Δ8-THC may be generated under certain conditions, for instance acidity, by double bond isomerism from Δ9-THC or its carboxylic acid, respectively. In the following, the chemical structures of some cannabinoid active principles and the nomenclature of the two active principles of tetrahydrocannabinol are specified, which bear the IUPAC names (6aR-trans)-6a,7,8,10a-tetrahydro-6,6,9-trimethyl-3-pentyl-6H-dibenzo[b,d]pyran-1-ol or Δ 9-THC, and (6aR-trans)-6a,7,10,10a -tetrahydro-6,6,9-trimethyl-3-pentyl-6H-dibenzo[b,d]pyran- 1-ol or Δ8-THC. Δ9-THC is also known under the designation of Dronabinol. Thus, e.g., DE 41 00 441 A1 discloses a process for producing 6,12-dihydro-6-hydroxy-cannabidiol and its use for producing trans-Δ 9-tetrahydrocannabinol. 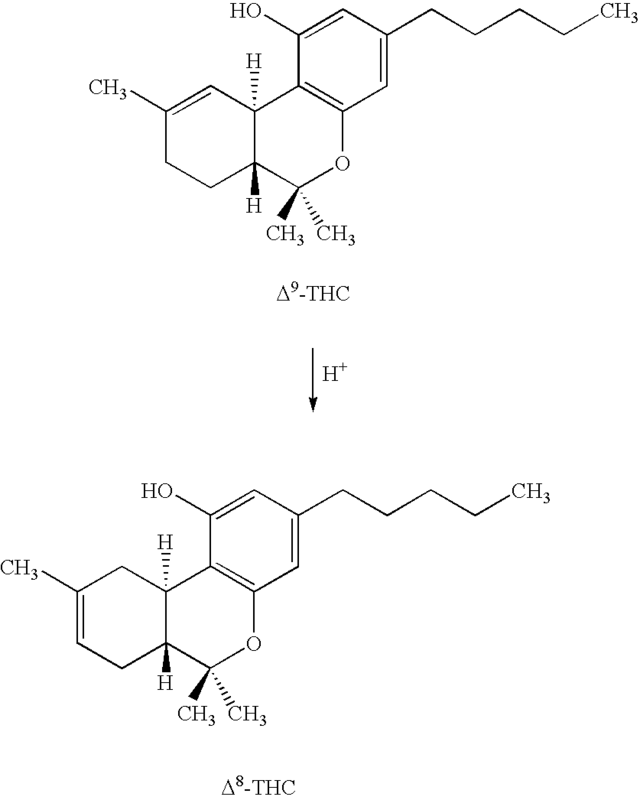 In particular DE 41 00 441 A1 describes the manufacture of 6,12-dihydro-6-hydroxy-cannabidiol, which is obtained by reacting olivetol and cis-p-menth-2-ene-1,8-diol, and its further reaction to trans-Δ9-tetrahydrocannabinol by using suitable catalysts. Apart from this, solvent extraction, e.g. with the aid of ethanol, and steam distillation of cannabis constituents is known; in particular a hashish oil (cannabis resin extract) also referred to as Oil, Red Oil or Indian Oil is known, which is produced with the aid of solvent extraction or distillation from cannabis herb or cannabis resin and which is a dark brown, viscous and sticky oil. The oil thus obtained is subsequently mostly diluted with edible oil for improved handling and contains up to 65% of the hallucinogenic agent Δ 9-THC (Kleiber/Kovar: Auswirkungen des Cannabiskonsums: Eine Expertise zu pharmakologischen and psychosozialen Konsequenzen, Stuttgart: Wiss. Verl.-Ges. 1998). Dronabinol, Δ 9-THC, has meanwhile been approved in the USA in accordance with USP [United States Pharmacopeia] 24, pp. 613, 614 as a medicament —also in capsule form—. In accordance with this monography, dronabinol contains no less than 95% of Δ9-THC and no more than 2% of Δ8-THC. Starting out from the above explained prior art and from the new legal situation in the Federal Republic of Germany, it accordingly was the object of the present invention to provide Δ 9-tetrahydrocannabinol, Δ8-tetrahydro-cannabinol and cannabidiol in pure form and as an extract in the form of preparations for medical applications, wherein the active principles should preferably be obtained from hemp varieties having low cannabinoid contents for the reason of better availability. In terms of process technology, this object is accomplished through the characterizing features of claims 1, 13 and 14. With regard to an extract having the main constituents Δ 9-THC, Δ8-THC and CBD, the above object is accomplished through the characterizing features of claim 8. In accordance with the invention, a primary extract containing tetrahydrocannabinol, cannabidiol, and optionally the carboxylic acids thereof, is obtained from cannabis plant material in that the dried plant material is comminuted, the plant material is extracted with the aid of CO 2 under supercritical pressure and temperature conditions at a temperature in the range of approx. 31° C. to 80° C. and at a pressure in the range of approx. 75 bar to 500 bar, or in the subcricital range at a temperature of approx. 20° C. to 30° C. and a supercritical pressure of approx. 100 bar to 350 bar; or extracted under subcricital pressure and temperature conditions; and the obtained primary extract is separated under subcricital conditions, or under conditions that are subcricital in terms of pressure and supercritical in terms of temperature. In terms of cannabinoids, the primary extract of the invention contains high proportions of cannabidiol carboxylic acid (CBDS), cannabidiol (CBD), and Δ 9-tetra-hydrocannabinol carboxylic acid (Δ9-THCS), and Δ9-THC (when drug hemp is used). The production of CO 2 extracts is known in principle. Thus, e.g., DE 198 00 330 A1 discloses the production of a pharmaceutically active extract from Tanacetum parthenium through CO2 extraction with the aid of an extraction plant as used in the present invention. As a particularly preferred cannabis plant material, for reasons of procurement on an industrial scale, one from  Cannabis sativa L., in particular hemp of the fiber type, i.e. so-called industrial hemp, is used. Owing to currently valid legislation, industrial hemp species of the fiber type may contain 0.3% of Δ 9-THC at maximum in the Federal Republic of Germany; for Switzerland an upper limit of 0.5% Δ9-THC applies, based on the dry plant mass in either case. It is thus advantageous if cannabis plant material of the fiber type may be used for the production of primary extracts containing Δ 9-THC and CBD, for it is possible to employ such starting material having a low Δ9-THC content for the inventive process without any further operating and handling permissions as are required in the case of drug hemp types. When it is possible to employ drug hemp types, however, the Δ 9-THC content in the primary extract is higher than in one produced of fiber hemp. The addition to the CO 2 of an entraining agent selected from the group consisting of: propane, butane, ethanol and water, has the advantage that hereby the yields for Δ9-THC and CBD may be increased without involving the drawbacks as with an extract produced, e.g., with ethanol or ethanol/water or methanol/chloroform or with other chlorinated hydrocarbons. Typically the entraining agent concentrations are in the range of 1 -10% based on the employed quantity of CO 2. The measure of arranging a layer of adsorbent on the material to be extracted downstream relative to the CO 2 flow has the advantage that monoterpenes and sesquiterpenes as well as alkaloids, flavonoids and chlorophylls may be separated out, so that the inventive primary extracts are even the more superior to the ethanol extracts known in the prior art and to the extracts prepared with the aid of chlorinated hydrocarbons, for the latter in any case are fairly high in mono- and sesquiterpenes as well as chlorophylls, flavonoids and alkaloids. As an alternative, the CO 2 laden with THC and CBD as well as with proportions of reduced mono- and sesquiterpenes, flavonoids, chlorophylls and alkaloids may also be passed over adsorbers charged with adsorbents or separators (FIG. 1). The inventive primary extracts from Cannabis plant material containing Δ 9-THC and cannabidiol are substantially free from monoterpenes and sesquiterpenes and moreover free from alkaloids and flavonoids, and contain practically no chlorophylls. Where a hemp of the drug type is used as a starting material, Δ 9-THC is the main constituent of the primary extract, and CBD the second highest proportion. In order to obtain Δ 9-THC and CBD from the primary extract thus purified, the cannabidiol carboxylic acids und Δ9-tetrahydrocannabinol carboxylic acids contained in the primary extract are decarboxylated into cannabidiol and Δ9-tetrahydrocannabinol through increase in temperature. Where Δ 9-THC is to be obtained as the main constituent or in pure form, the CBD may be reacted into Δ9-THC through catalyzed cyclization. Here a Δ 8-THC may form depending on process conditions, which in itself also possesses interesting pharmacological properties. Thus Δ8-THC may, for example, be employed as an antiemetic in pediatric oncology. The decarboxylated primary extract is mixed with a water-binding agent and a catalyst defined more closely hereinbelow. The mixture is treated in a high-pressure extraction plant (FIG. 2) with supercritical CO 2, preferably at 300 bar and 70° C. By this treatment, the CBD present in the primary extract is substantially reacted to Δ8-THC and Δ9-THC. The obtained extract is separated out under pressure and temperature conditions subcricital for CO 2, preferably at approx. 55 bar and approx. 25° C.
The secondary extract thus obtained only contains very little CBD and is highly enriched in Δ 8-THC and Δ9-THC. Suitably for obtaining pure or nearly pure Δ 9-THC or Δ8-THC, respectively, a treatment in a high-pressure apparatus with supercritical CO2 is performed as described in the following (FIG. 3). To this end, preferably a high-pressure column (FIG. 3) subdivided into segments, comprising a bottom segment for dissolving the primary extract in supercritical CO 2, a purification segment filled, e.g., with silica gel (mean particle size of 0.02 mm to 0.2 mm, preferably 0.1 mm), a head segment for discharging the mixture dissolved in supercritical CO2 of CBD, Δ8-THC and Δ9-THC into three separating vessels for separate separation of the purified CBD and the purified Δ8-THC and Δ9-THC. The extraction conditions prevailing for purification in the column are supercritical for CO 2, preferably 180 bar and 55° C., in the first separating vessel where CBD is separated out for CO2 subcricital conditions in terms of pressure and supercritical conditions in terms of temperature, preferably 70 bar and 50° C. In the second and third separating vessels, where Δ8-THC and Δ9-THC are separated out, conditions subcricital for CO2 in terms of pressure and temperature are to prevail, in the second separating vessel preferably 60 bar and 30° C., in the third separating vessel preferably 55 bar and 25° C.
If fiber hemp is used, it may possibly be necessary to further purify the tetrahydrocannabinol products Δ 8-THC and Δ9-THC thus obtained with the aid of additional processes such as preparative chromatography or HPLC. Where the primary extract was obtained from drug hemp and purified CBD is furthermore desired as an end product besides purified Δ 9-THC, the cyclization of CBD into Δ8-THC and Δ9-THC, or the production of a secondary extract is omitted. Δ8-THC is an isomer of Δ9-THC and forms substantially during the cyclization of CBD zu Δ9-THC as well as in the presence of acids. Under certain circumstances it is necessary for the Δ8-THC, Δ9-THC and CBD thus obtained to be purified by further processes such as preparative chromatography or HPLC. As may be seen from the scheme of formulae, Δ 9-THC may under the action of acids isomerize to Δ8-THC. As cannabidiol taken for itself has interesting pharmacological properties while furthermore lacking the psychotropic hallucinogenic effect of Δ 9-THC, cannabidiol itself is also of interest for practical application because it may be used, e.g., as an anti-epileptic. Δ 8-THC by itself also has substantially lower psychotropic hallucinogenic effects than Δ9-THC and may be obtained in accordance with claim 14. FIG. 3 is a schematic representation of a CO 2 extraction plant for separation of a primary and/or secondary extract in CBD, optionally Δ8-THC and Δ9-THC in a high-pressure column. Ground Cannabis plant material comprised substantially of inflorescences and leaves is charged into extracting vessels  1-4. CO2 having been brought to a temperature of approx. 60° C. and to a pressure of approx. 250 bar, enters into contact with the material to be extracted in the extracting vessels 1-4 and extracts the desired cannabinoid components, in particular comprising Δ9-tetrahydrocannabinol and cannabidiol as well as the carboxylic acids thereof. Suitably for extraction a flow rate of 50-150 kg of CO2/kg of starting material is used. At the upper end of extracting vessel  4, an extract enriched in the cannabinoids leaves the vessel via conduit 6 a and arrives at the bottom of separating vessel 5 a. The separating vessels 5 a and 5 b are in the exemplary case filled with various zeolitic molecular sieves and with diatomaceous earth as an adsorbent. In separating vessels 5 a and 5 b, the same pressure and temperature conditions prevail as in extracting vessels 1-4. The zeolitic molecular sieves placed in container 6 a have an internal surface of approx. 800 m2/g, the zeolitic molecular sieves placed in container 6 b have an internal surface of approx. 1200 m2/g. By charging containers  6 a and 5 b with molecular sieves—preferred, however not indispensable—alkaloids, flavonoids and chlorophylls are further separated from the CO2 loaded with extract. This CO2 extraction mixture thus purified exits from the head of vessel 5 b via conduit 7, pressure regulation valve 8, with extraction pressure being reduced to less than 75 bar, in the exemplary case to approx. 60 bar. The CO2 extract mixture then arrives at heat exchanger 9 where it is heated to a temperature supercritical for CO2, preferably to 45° C.
Under these pressure and temperature conditions, extraction of that extract portion takes place in the separating vessel  10 which essentially still contains undesirable monoterpenes and sesquiterpenes. The extract mixture consisting of CO2 and essentially of Δ9-THC and cannabidiol as well as the carboxylic acids thereof, exits from separating vessel 10 via conduit 11, pressure regulation valve 12, heat exchanger 13, and finally is conveyed into separating vessel 14. With the aid of pressure regulation valve  12, the separation pressure in container 14 is set to pressure conditions subcricital for CO2, in the exemplary case 50 bar. The separation temperature in vessel 14 is controlled by heat exchanger 13 to a temperature subcricital for CO2, in the exemplary case about 20° C. Under these conditions the pure CO2 is separated from the primary extract enriched in Δ9-THC and cannabidiol and the carboxylic acids thereof in separating vessel 14. The pure CO 2 is conveyed via conduit 15 to liquefier 17 that is equipped with a condenser coil 16. From here the liquid CO2 is supplied via pressurizing pump 18 to heat exchanger 19, to be available for the following extraction cycle. For opening the extracting vessel, i.e. for charging and emptying the vessels with, or of, the starting material, the CO 2 is either vented directly via conduit 21, or supplied via conduit 20 to recycling plant 22 which then pumps the liquid CO2 into the CO2 storage vessel 23. FIG. 2 shows a schematic representation of a CO 2 extraction plant for producing a secondary extract highly enriched in Δ8-THC and Δ9-THC. For the reaction, in particular the decarboxylation, of the cannabinoid carboxylic acids contained in the primary extract into Δ 9-THC and CBD, the primary extract in the exemplary case is treated during about 2 hours at 80° C.
A mixture of decarboxylated primary extract, water-binding agent and catalyst is introduced into the extracting vessel  200. CO2 at a temperature of 70° C. and a pressure of 300 bar enters into contact with the material to be extracted and extracts the desired components. Following cyclization, the secondary extract highly enriched in Δ 8-THC and Δ9-THC exits from vessel 200 at the top end of extracting vessel 200 via conduit 202 and arrives in separating vessel 205 via regulating valve 203—wherein pressure is reduced to 60 bar or 55 bar, respectively—and heat exchanger 204, the temperature being 30° C. or 25° C., respectively. Through valve 206 the secondary extract thus obtained, which contains small amounts of CBD and is highly enriched in Δ8-THC and Δ9-THC, may be withdrawn from separating vessel 205. The pure CO 2 is conveyed via conduit 207 to liquefier 208 which is equipped with a condenser coil 209. From there the liquid CO2 is supplied via pressurizing pump 210 to heat exchanger 211, to be available for the following extraction cycle. FIG. 3 shows a schematic representation of a CO 2 extraction plant for separation of a primary and/or secondary extract CBD, optionally Δ8-THC and Δ9-THC, in a high-pressure column. Via extraction column  300 wherein an extraction pressure of 180 bar and a temperature of 55° C. prevail, consisting of bottom segment 301 a, purification segment 301 b (charged with silica gel) and head segment 301 c, the extract mixture dissolved in CO2 arrives via duct 302, regulating valve 303 and heat exchanger 304 in separating vessel 305, where preferably a pressure of 70 bar and a temperature of 50° C. are to prevail. It is here that the CBD is obtained. Via duct  307, regulating valve 308 and heat exchanger 309 the extraction mixture arrives in the second separating vessel 310, preferably with a pressure of 60 bar and a temperature of 30° C. prevailing. It is here that the separation of Δ8-THC takes place. Via valve 311 the obtained Δ8-THC may be withdrawn. The Δ 9-THC still dissolved in CO2 is transferred into separating vessel 315 via duct 312, regulating valve 313 and heat exchanger 314. There it is separated out under a pressure of preferably 55 bar and a temperature of preferably 25° C. Via valve 316 the obtained Δ9-THC may be withdrawn. The pure CO 2 is conveyed via conduit 317 to liquefier 318 which is equipped with a condenser coil 319. From here the liquid CO2 is supplied via pressurizing pump 320 to heat exchanger 321, to be available for the following extraction cycle. As industrial hemp of the fiber type, in the present exemplary case the French Cannabis sativa variety Fedora 19 is employed. The raw drug has an average content of approx. 0.25% of Δ 9-THC and 1.54% of CBD. # extracted for 24 hours in 4 l of hexane in accordance with the Soxhlet method. The solvent was removed under reduced pressure, and the obtained extract was analyzed with a view to the parameters indicated in Table 1. When one compares the data of the CO 2 primary extract in accordance with the present invention as shown in Table 1 with the hexane extract in accordance with WO00/25127 and the ethanol extract, initially the relatively good coincidence of the primary extracts obtained by means of the organic solvents is conspicuous. Moreover in comparison with the CO 2 primary extract of the present invention, there results a disadvantageously high chlorophyll content of 3.00% for the hexane extract and of 2.85% for the ethanol extract. For the extract of the invention, the chlorophyll content thus is lower by a factor of almost 300 than in the prior-art extracts. The desired CBD content is in the inventive CO 2 extract higher by a factor 4 to 5, and the Δ9-THC content also by a factor>4, in comparison with the prior-art solvent extracts. If one regards the overall cannabinoid content, essentially composed of CBD, Δ 9-THC and CBN, it may be seen that even the inventive primary CO2 extract already is made up at more than two thirds of these constituents, whereas the prior-art extracts only contain an overall cannabinoid content of approx. 15 to 17%. The contents of undesirable monoterpenes listed in Table 1 are higher by a factor of 10-30 than in the two primary extracts obtained with ethanol and hexane than in the CO 2 primary extract, and while the sesquiterpene content is higher by a factor 20 to 40 than in the inventive CO2 extracts. It is moreover noted that the primary extracts obtained with the aid of lipophilic solvents contain the alkaloids that are readily soluble in these solvents, such as, e.g., cannabisativin which is highly cytotoxic. This alkaloid contamination may very well also still occur in an extract prepared in accordance with WO00/25127 from the primary extract described there, following additional purification and enrichment steps in accordance with WO00/25127 which extract is said to have a 98% content of Δ 9-THC. Thus the ethanol extract contains about 200 times more toxic alkaloids, in particular the highly cytotoxic cannabissativin, and the hexane extract in accordance with WO00/25127 even about 350 times more than the CO 2 primary extract of the invention. Thus the CO 2 extracts of the present invention are superior both to the hexane extracts in accordance with WO00/25127 and to the customary ethanol extracts, because of their high cannabinoid contents and the fact that they are largely free from alkaloids, flavonoid glycosides, mono- and sesqiterpenes. In view of this very fact it thus is already surprising that THC and cannabinoids may at all be enriched in technically useful amounts from readily available industrial hemp by means of CO 2 extraction. Measured substance T2 = 25° C.
Measured T4 = 25° C.
the obtained primary extract is separated out under subcricital conditions or under conditions subcricital in terms of pressure and supercritical in terms of temperature. 2. The process according to claim 1, characterized in that plant material of Cannabis sativa L., in particular hemp of the fiber type and/or hemp of the drug type, is employed as cannabis plant material. 3. The process according to claim 1 or 2, characterized in that to the CO2 an entraining agent is added which is selected from the group comprised of: propane, butane, ethanol, and water. 4. The process according to any one of claims 1 to 3, characterized in that in the supercritical range a temperature of approx. 45° C. to approx. 65° C. and a pressure of approx. 100 bar to 350 bar, preferably a temperature of approx. 60° C. and a pressure of approx. 250 bar, are used. 5. The process according to any one of claims 1 to 4, characterized in that an adsorbent is arranged on the material to be extracted downstream in terms of the CO2 flow. 6. The process according to claim 5, characterized in that the adsorbent is selected from the group comprised of: silica gel, diatomaceous earth, bentonites, bleaching earth, activated carbons, in particular magnesium oxide and alumina, as well as mixtures thereof. 7. The process according to any one of claims 1 to 6, characterized in that extraction is repeated at least once, with extraction preferably being repeated with diatomaceous earth and/or another adsorbent. in that it contains at least reduced proportions of monoterpene and sesquiterpene hydrocarbons, alkaloids, flavonoids and chlorophylls. 9. A primary extract according to claim 8, characterized in that tetrahydrocannabinol includes at least Δ9-tetrahydrocannabinol and/or Δ8-tetrahydrocannabinol and/or the carboxylic acids thereof. 10. A primary extract according to claim 8 or 9, characterized in that tetrahydrocannabinol and/or the carboxylic acids thereof are the main constituent if a hemp of the drug type is used as a starting material. 11. A primary extract according to any one of claims 8 to 10, characterized in that cannabidiol and/or the carboxylic acids thereof are the main constituent if a hemp of the fiber type is used as a starting material. 12. A primary extract according to any one of claims 8 to 11, characterized in that it is dissolved in ethanol, separated from waxes not soluble therein, and the solvent is again removed under reduced pressure. the product enriched in tetrahydrocannabinol is separated at pressure and temperature conditions subcricital for CO2. subsequently the cannabidiol is separated through column chromatography on silica gel or preparative high-pressure liquid chromatography.